Back to 3 this week! A couple hiccups this week. A.) i fell asleep almost instantly after getting home yesterday so this post is a day late. B.) for some reason the 3rd FOOD TIME video was saying that it was unrecognizable when i tried to embed it. Then i noticed that it was all static "error occured loading media" when i went to it. So i deleted it.... i dont have it backed up on my computer either. Oh well. I guess atleast i got 2 this week. If you want more (and there is more) consider joining my Patreon! I upload tons of stuff to it just for my Patreon peeps, sometimes several secret things a day. Like early sneak peeks, screenshots, free to use stock footage and effects, and moar! Im now 20 days into this whole "taking it seriously" thing and i guess its actually working. Who would've thought hard work would yield results? 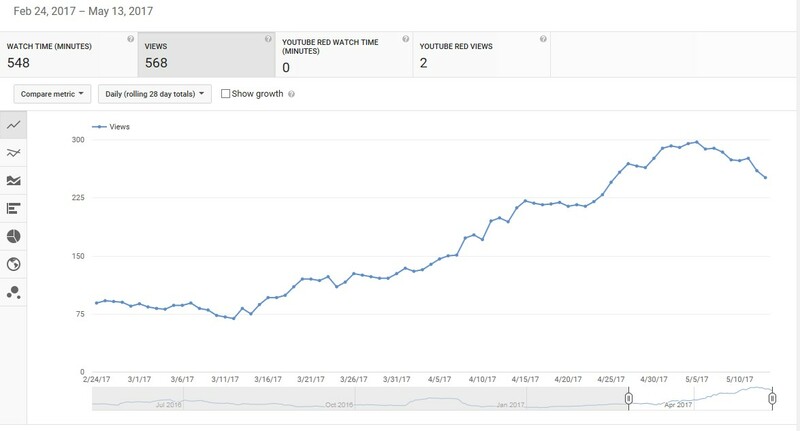 Ive done well so far with uploading about 3 videos a week and though the videos on their own aren't getting much attention... (in comparison to my past once-in-a-blue-moon uploads) ...they are still getting SOME views. 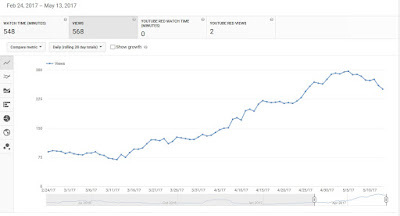 Since im uploading and doing A LOT more now, those tiny bits of attention seem to be adding up... assuming this chart isn't a dirty damn liar. On top of the uploads, ive been trying out "summary" posts here on my website where i simply upload a collection of whatever vids i had already uploaded that week. Looking at each individual video ive noticed i get 2 view spikes now. Once when its uploaded, then again when i do the summary post. Jumping to the sharing and social media side of things. I went ahead and got a Twitter and Patreon! (you guys should totally check those out if you haven't already.) Following me would really help out a lot, hell you could even mute my posts and Patreon has a simple "follow" option that doesnt require money spent at all. With those sites ive been sure to repost ANYTHING i do creatively and EVERYTHING i do to the Patreon, cuz lets face it, if you're supporting me on Patreon you deserve to see where your money is going! Now on a serious note. Want access to EVEN MORE videos and whatnot? You should totally consider checking out my Patreon! I post even more Patreon exclusive videos on there, among other things!